The number of children who died of abuse or neglect in Massachusetts is down. The news comes as the state's child welfare agency implements new policies in a sweeping overhaul of the state Department of Children and Families. But in a joint investigation with the New England Center for Investigative Reporting, we’ve found the state has failed to fix a critical component of reform. Sitting in her West Dennis apartment, Jenn Cronin flips through pictures of her children in happier times. Pointing to a picture of her son Lucas Braman at the beach, her face clouds and her eyes well up with tears. "I knew it immediately," she says. "I knew it immediately that this wasn't supposed to happen." Twenty-three-month old Lucas is part of a devastating list - children who the Department of Children and Families say died of abuse or neglect in 2014. 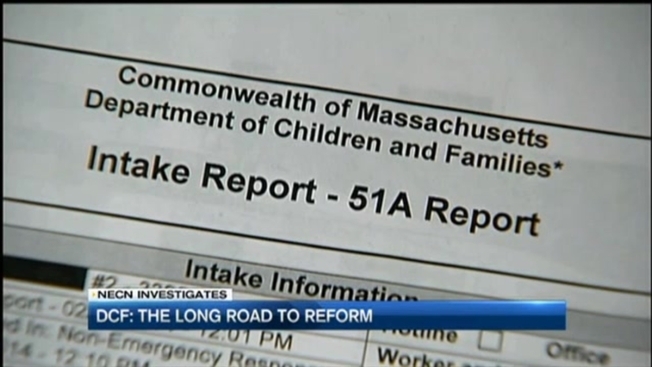 In a joint investigation with the New England Center for Investigative Reporting, necn found nearly half of those children had at some point been engaged with state social workers. According to federal data obtained by NECIR and necn, those numbers actually reflect a 44 percent drop in child abuse deaths in 2014 - the most recent data available. "It could be the ebb and flow or there could be more to it," DCF supervisor and SEIU Local 509 union representative Peter Mackinnon says. "It's hard to tell just by that data alone." Mackinnon says one year is not a trend, but he does point out that 2014 marked the beginning of the state's effort to hire more social workers at the troubled agency and social workers got more aggressive in removing children from troubled homes. After the state admitted that DCF bungled a string of abuse cases, Gov. Charlie Baker last September announced a major overhaul of the agency. Its budget was increased. A net of 54 social workers have been hired, along with more managers to oversee them. And - this month - social workers have begun to put new policy into practice. The agency has also ended what some social workers called a dangerous two-track system where some cases were labeled lower risk resulting in less aggressive monitoring of children. Lucas was on that lower track. The toddler was found unresponsive in his crib in this Yarmouth home. His mother, who had been addicted to painkillers, had lost custody of Lucas and his then 3-year-old sister Layla, but says DCF didn't do enough to investigate her fears that the children were suffering abuse. In a DCF investigation conducted after Lucas died, a state investigator found enough evidence to support allegations that the children had been burned, bitten, pinched and slapped. In the investigator’s report provided to Cronin by DCF, the investigator wrote that abuse and neglect "ultimately played a role in Lucas' death..."
The toddler's cause of death remains undetermined by the medical examiner and the criminal investigation is ongoing. Says Cronin, "They failed Lucas and they failed Layla and they failed my family." We wanted to talk to DCF Commissioner Linda Spears on how the agencies new policies could keep children from falling through the cracks, but she declined our request for an interview. "In September 2015, the Baker administration and the Department embarked on a comprehensive, multi-faceted and multi-year reform effort to address longstanding policies that were not strong enough to keep children safe. As a result, DCF has already overhauled its protective intake policy to ensure clear direction and expectation for screening and responding to reports of abuse and neglect and created a supervision policy to increase management oversight, both of which will be implemented on February 29th." Mackinnon applauds the efforts at reform, but says little can change if social worker caseloads remain at crisis levels. Federal recommendations say social workers should not carry a load of more than 15 families. Massachusetts has set that bar at no more than 18, but the state admits, that nearly 60 percent of DCF social workers carry a caseload heavier than the 18 limit. "There are workers still that have - many workers -- that have 25 to 30 families on their caseload," Mackinnon says. "Some have 50 or 60 kids on their caseload that they're responsible for." He likens DCF to righting a tanker: "Three decades of ignoring the problem and trying to fix it in a relatively short time frame is a tremendous task." It's a task that Baker hopes to make easier in his next budget. He has proposed an additional $12 million to hire more than 250 social workers.